What I like about Nokia is the human touch in everything that they are doing. Well, don’t call me romantic because it is very well known what really spins the world (of technology), but Nokia is always trying to be humane company. Nokia announced the partnership with Bitwalking to launch digital currency mining for charity. They created the Nokia-Bitwalking Walk for Cause virtual event that will run from October 17 to 20, along with the Futurecom Conference in São Paulo, Brazil, and will be available to all Bitwalking users in Latin American countries. 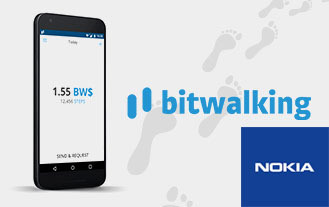 Users will be able to download a BitWalking app from Google Play store that will enable them to join Nokia’s event. During the 4-day event, users will generate Walking Dollars and can commit them to the cause. At the end of the event, Nokia will convert the raised W$ into USD and donate that money to education project providing computers and Keepod devices to students in the region.